Letterbox Love is a weekly feature that is hosted by Lynsey at Narratively Speaking and basically, the idea came out of a discussion with other UK book bloggers about the need to do a weekly meme with more of a British feel to it. 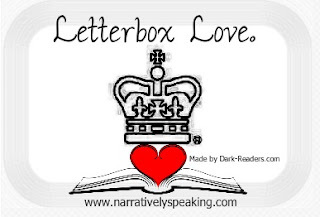 Therefore, Letterbox Love was born and the logo was lovingly designed by Dark Readers. Letterbox Love is a way for us to share the books that come through our letterbox, galleys and e-books (through our electronic letterbox) and any other bookish goodies that we want to tell you about. This book sounds fantastic and I was lucky enough to be offered it for review from the lovely folks at lovereading4kids.co.uk. Some of my fellow bloggers have read it and sang its praise and it does sound as if it will be very funny so I can’t wait to get stuck in. Thanks to Lovereading4kids.co.uk and Hot Key Books for sending this over! This book arrived on my doorstep yesterday and that was the first I’d heard about it. The blurb suggests its about the housemaid from Longbourn, the house from Pride & Prejudice, and her side of the P&P story. I might struggle with this a little bit because I believe P&P might be the only Austen book I haven’t read, or at least I can’t remember reading it, but I will be giving it a try. If not I will make my sister review it for me as she loves books like this! Thanks to Transworld Publishers for the copy though! I am so, so grateful to Hot Key Books for sending me this book. I have loved Looking for JJ since I read it as a teen and I have a lot of time for Anne Cassidy so when I heard she was doing a sequel I knew I just had to have it. I cheekily asked Hot Key if they had a spare copy of Finding Jennifer Jones going and they played Santa Claus, sending me one over just in time for my Christmas break! I will definitely be reading it this week and will be sure to share my thoughts as soon as I have done. Thanks again Hot Key Books!! I read Longbourn a couple of weeks ago and I loved it – such a good story whether you’ve read P&P or not but I did like the way it develops the characters I already knew from P&P. I’d definitely recommend it and it’s lovely to curl up with on a cold day. Hope you enjoy your new books! I got Longbourn as well and intend to give it a go, even though I wouldn’t normally read that sort of thing. We’ll see! So so excited for Boys Dont Knit, cant wait to read it! I read Longbourn a few months ago, in hardback. I love Pride and Prejudice, which might have affected my review a little, as I really didn’t like this at all. I’m usually interested in spin-offs and retellings, but it just didn’t do it for me.